Female directors do better at Sundance than at the multiplex: Please hold your applause. 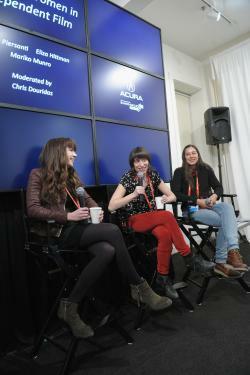 Participants at the Emerging Women in Independent Film event at the Sundance Film Festival. When the Sundance Film Festival announced its lineup in January, it also announced that it had hit an important milestone: Half of the narrative films in its feature competition were directed by women. And now a new joint study by the Sundance Institute and Women In Film reports that Sundance has consistently bested the commercial film market in getting work by women in front of its audience. But even if Sundance does a better job than the movie industry as a whole—which is, frankly, no surprise—that doesn’t mean its job is done, or that women, who had a steep climb from the bottom, are continuing to make progress in independent film. Of the 100 most-profitable movies released in the commercial market between 2002 and 2012, just 4.4 percent were directed by women, as compared to 16.9 percent of American narrative features and 34.5 percent of documentaries that showed at Sundance during the same period. But over that time, the number of female directors showing movies in all categories at Sundance stayed essentially the same, with minor year-to-year fluctuations. That rise in female directors in one category, the narrative feature competition? Good news, but not a sign that Sundance has moved the dial permanently. And another important caveat: As the study points out, women are still having trouble getting into the Premiere category. “Given that Premiere films often have higher budgets and more prominent talent attached, this downward trend in female involvement is likely due to [this festival section] moving from the independent space toward more commercial fare,” the report’s authors wrote. In other words: Even at Sundance, there is a female ghetto. I’ll absolutely take the lineup at Sundance over the one at my local multiplex most weekends. But it’s not enough for a festival that’s so proud of its work promoting new voices, and for independent film in general, to simply be better than studio competitors. You can’t be proud when the bar is so low.